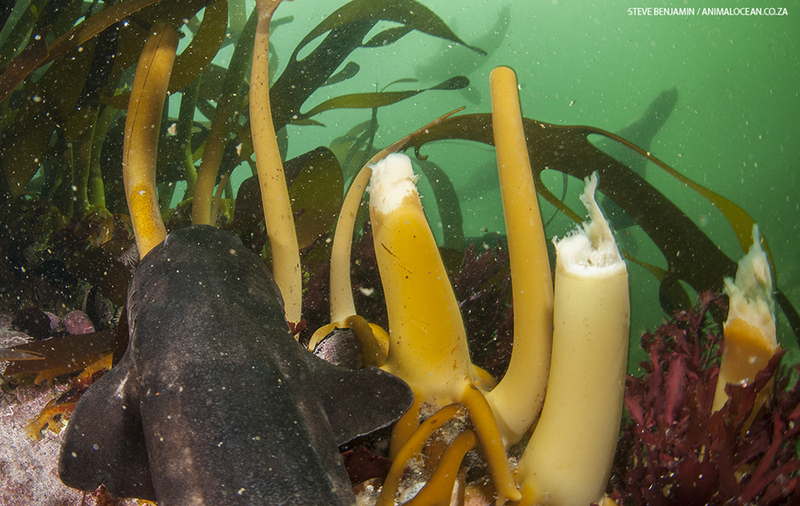 We often find Dark shysharks (Haploblepharus pictus) around Duiker Island, hiding in the kelp forest. This seemed unusual to me, as it is well know that Cape Fur seals eat most species of small sharks. This has been photographed by many and there are examples online (Chris Fallows). However we often see these small sharks swimming around, without the seals paying them any attention. Shysharks and Catsharks belong to a large group of bottom dwelling sharks. 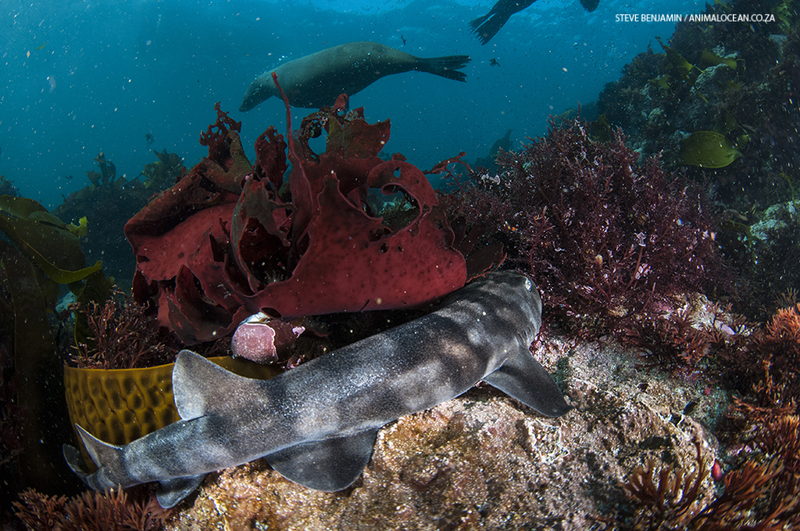 Here in the Cape we have a few endemic species like the Puffadder Shyshark and the Dark Shyshark. These species get their name from their habbit roll into a ball when threatened. They wrap their tail around and cover their head. It look like they are using their tail to cover their eyes and be shy. It is in fact a very cleaver way of making themselves bigger. Their main predators are large reef fish like Red Roman, Red Steenbras, Sevengill sharks and Cape Fur Seals. All of these predators need to swallow their prey or rip it apart. So being an awkward shape, like a large doughnut, is a great idea. You can check out our Catshark and Shyshark episode on our Youtube Channel, its alot of fun! 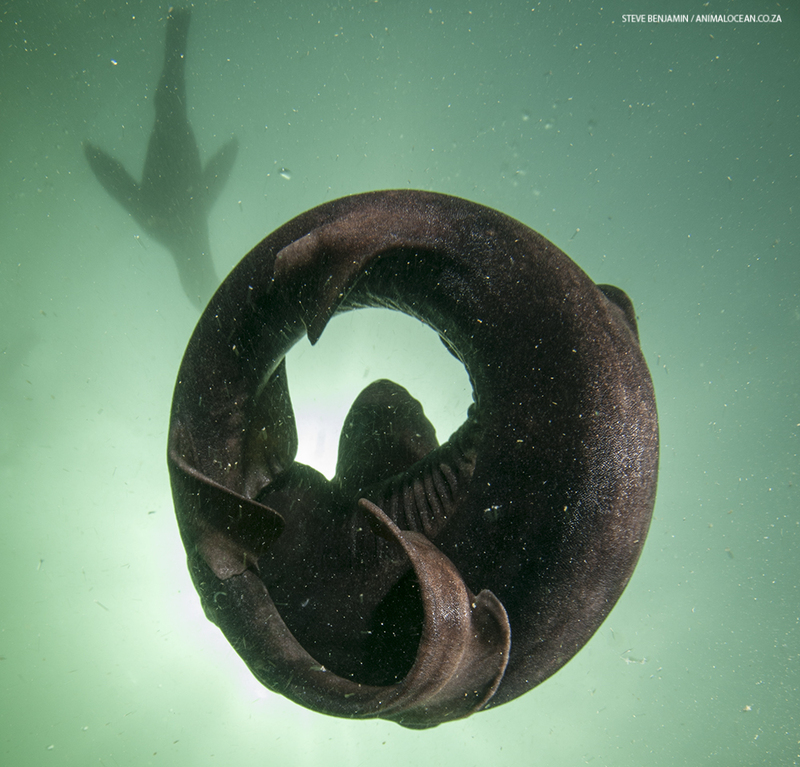 Recently we found evidence that these Shysharks are not only living with the Cape Fur seals, but even laying their eggs. We noticed two shyshark eggs in shallow water at Duiker Island. 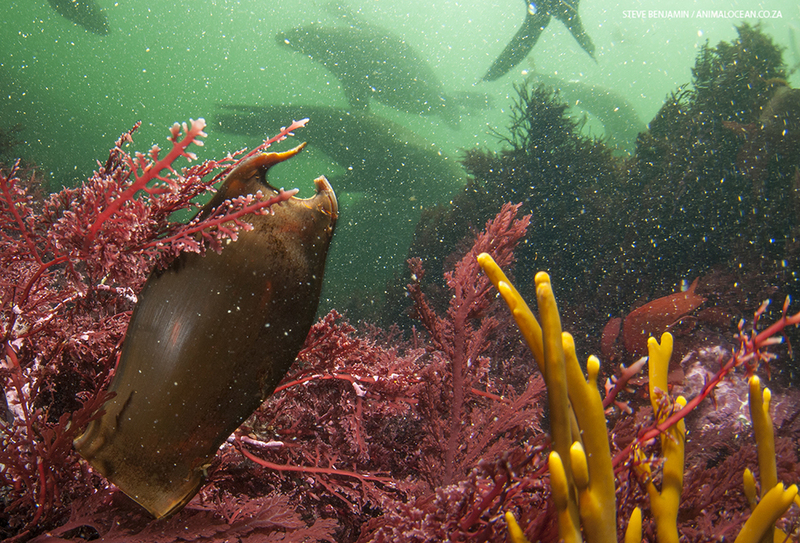 These eggs are often called Mermaids Purses as they resemble and pouch that might contain something. These are commonly found washed up on the beach after the little shark has broken free and hatched. These eggs are wound around the base of seaweeds, where the water moment will keep them clean and away from their main predators, whelks. They can take up to 6 months to hatch, that along time for a little shark to avoid being eaten.